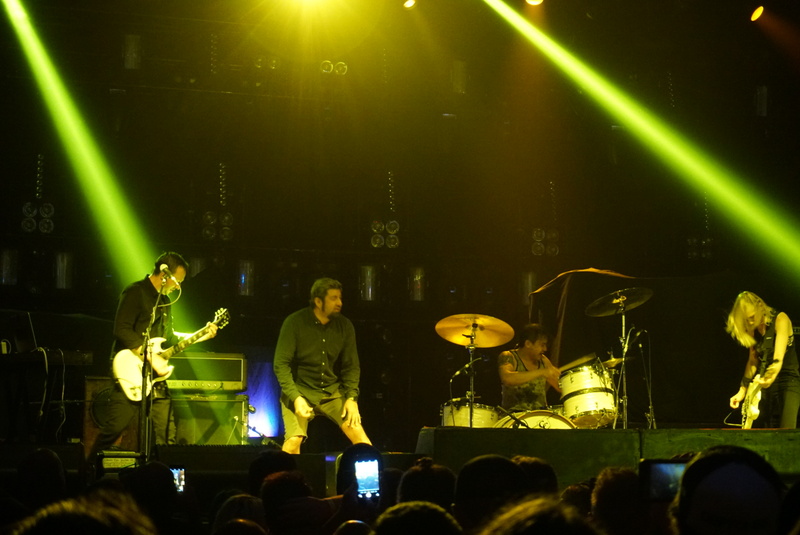 In case you didn’t catch my show review from a couple months ago that covered the Deftones show where Spotlights opened, let me explain again my love for Spotlights… They rule! They’re heavy, they’re dreamy, they’re creative. Basically all I need from a band to become obsessed with them. If you are new to the band I highly recommend checking out their latest release Tidals, an album that is most definitely going to be occupying a spot on my favorite albums of the years list. I have followed the co-founders of Spotlights Mario and Sarah Quintero’s (husband and wife) musical career for a few years now and have covered the majority of their musical projects on the site, but I hadn’t really had the chance yet to pick their brains about how Spotlights came to be. So I conned Mario into doing an interview and we talked about the tour with the Deftones, the writing process for Tidals, and what Spotlights have in store for the future. How did the tour with Deftones come about? Was it through Aaron Harris and him having co-produce the last Sleep Lady album and that he drum techs for Abe and is in Palms with Chino? Haha! Well, I believe Aaron shared the premiere of Walls that Brooklyn Vegan did for us in March and the next day we got an email from Deftones’ booking agent asking if we were available to go on tour in August. So in a sense, yes? How was the tour? Judging from your tour journal and social media it seems like you really became great friends with the both Refused and Deftones? In all seriousness, both bands and their crew are some of the kindest most inspiring humans we’ve ever met. We were welcomed as family and made some great friends. Watching the guys play every night was the such a true lesson in professionalism. They’re both incredible. How were the crowds on tour? Some of those die-hard fans of early Deftones music can be hard to win over. The crowds were the best we have experienced. Though they varied from town to town, we met some great people and were well received at all the shows. So I got to see your fill-in drummer Chris Enriquez and he was amazing live. How did you meet him and how did he come to be in the band? Also, is your main drummer Josh Cooper just your live drummer or a permanent member? How did you meet Josh as well? Josh is our live drummer. We met him through his other band Carved Up who are our Crowquill label mates, and we hit it off. He’s a great drummer and we really lucked out when he agreed to take over on drum duties for live shows. When we got the offer for the Deftones tour, we were already slotted for the tour with If These Trees Could Talk and Driftoff, and Josh had some other travel plans in late August so he wasn’t able to cover all the dates. Chris is one of the best drummers in town, so it was a no brainier when we had to find a fill in for Josh. We also picked up our old drummer from Sleep lady, Tony Dixon (AKA Pork Chop), in San Diego to finish off the rest of the ITTCT tour since Josh couldn’t finish the rest of those shows. It was great to get back with Tony after so long. We had a blast. Mario in your past musical project (Machines Learning) you’ve been the drummer. Is it weird being out front on the guitar? Is it hard letting those live drumming duties go? Which, do you prefer? Ha, I’ve mostly played guitar in bands. Machines is really the only band I played live with on drums. And that mainly happened since I played drums on the record. I started out playing drums in Spotlights but we wanted to focus the music towards a more guitar oriented sound, so that’s how we got to where we are now. I love playing both but I’m much more a guitar player than a drummer. Your latest releases Tidals is one of my favorite albums so far in 2016. Tell me what the writing process was like and how it differs from Demonstration. The new stuff almost feels like a continuation. Thank you! Sarah and I have a good system that works for us when it comes to writing. I basically record demos of ideas and then we both work them until we’re happy with them. Then I will record drums and we start adding guitars/bass and synths. Demonstration was recorded in a couple days at home and our practice space without much concern about production etc. With Tidals, though we recorded most of it the same way, we approached it more like real album. I definitely think there’s a flow from one to the other too. What are the influences/themes on the music, lyrics, and the cover art for Tidals? I guess the main “theme” in a sonic sense is the size and power of the ocean. We wanted it to have an ebb and flow hence the name and art. Lyrically, it goes through different themes that I think are open to interpretation, but range from longing for lost loved ones to the sickness of religious and cult fanaticism. Who have you been listening to lately? Any friend bands or locals that you’d like to give a nod to and that we should check out? Man, there are so many great bands in Brooklyn right now but a couple stand outs are Netherlands and Haan. Others are Godmaker, Primitive Weapons, Driftoff, Mutoid Man and Husbandry just to name a few. Any new tunes / projects in the works for you? Yeah! We’re pretty far in the demo process for our next record and were pretty excited about the direction it’s going in. Looking forward to putting some feelers out for the next release. I might be putting some time into another Codas release this year too but we’ll see. Last question, I know you’ve got another tour coming up. Tell us the details on that? So it was a national run with If These Trees Could Talk and Driftoff. It was amazing. Both bands are so damn good and a great bunch of dudes. Drove about 9,000 miles, had some really great shows and we became one big family by the end. I’m missing all of them lots. Luckily, the Driftoff dudes live in Brooklyn so we get to hang and reminisce. Editors Note: Spotlights are about to drop a dope new EP featuring a Mew cover, a re-worked version of an old jam, and a remix of one of their songs by Aaron Harris (Isis the band / Palms drummer, engineer / producer extrodinare). Check the Mew cover below.